The last 72 hours has seen a whirlwind of activity regarding the Autism Positivity 2012 Flash Blog and those words “I wish I didn’t have Aspergers.” It has been incredible to witness. To recap – A group of bloggers devoted days of their time and energy to come up with and create the Autism Positivity Flash Blog. They then reached out to all the bloggers they knew, asking for each to contribute something. New contributions were posted every 15 minutes on the last day of April, with more trickling in after that. I don’t know what the total ended up being, but it was well over 115 contributions. As a result of their efforts, a whole community of Autistics, Aspergers, Parents of Autistics and Parents of Aspergers were galvanized and inspired to come together in support of any Autist who has ever felt – marginalized, less than, misunderstood, ignored or alone – even if for only a minute. It was an incredible show of strength in numbers, of people working together, of a diverse and vibrant community uniting and reaching out to another (anonymous) human being. “This is how it is every day living with Aspergers.” The analogy being drawn between the frustration of not fully getting everything someone is saying, whole chunks of what is being said are erased, and trying to make sense of it all anyway, while being expected to respond was so powerful to me. I thought – What if it was this way when you tried to express yourself as well? What if you had a whole idea, something you wanted to relate to another person, but then had to submit it (say it) in short segments, yet it came out scrambled and not in the right order with some of what you wanted to say not coming out at all? What if this was your constant experience in attempting to communicate with others? Imagine if every time you had a conversation with someone this was your experience in both receiving information and giving? Imagine how incredibly frustrating that would be. Imagine if this happened not once, when you could shrug it off knowing that it was a one time annoyance and while irritating not an ongoing problem, but each and every time you spoke. Imagine that your experience of communicating was to have people routinely misunderstand you or respond to the last part of what you’d said without hearing or understanding the first part. Imagine if when people spoke to you, you lost portions of what they were saying. Imagine what it would be like to ask them to repeat themselves and have them lose their patience with you. Imagine if you were scolded, ridiculed, called names and punished for not giving an appropriate response. Just imagine how that would make you feel. So Genisa, I hope it’s okay to reprint the comment you left on the Huffington Post here in it’s entirety so that others may find you and reach back to you. Genisa! I am so glad you reached out and commented. 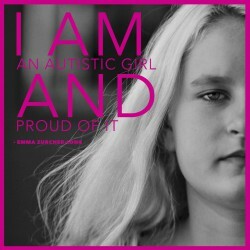 If you haven’t already gone to the Autism Positivity 2012 Flash Blog, do. Because of those words typed into Google, you galvanized and inspired a group of bloggers to create the Autism Positivity Flash Blog. I don’t know how many people have contributed at this moment, but I do know as of yesterday morning over 115 people had written a reply to your words. Those replies are from Autists, Aspies, Parents of Aspergers and Parents of Autists. Over 115 people, Genisa. You are NOT alone. Go to the flash blog read the responses from people, most of them have blogs, go to their blogs and reach out to the ones that speak to you. Many will respond. You have found your people! When I was in my 20’s I was suicidal. (This is not something I often talk about.) I felt utterly hopeless, I had an eating disorder, was bulimic with anorexic tendencies that I could not contain or control, my life revolved around eating, puking, how much I weighed and where and what I would eat next, all as a way to quell my feelings of self loathing. To someone who’s never had an eating disorder it must sound completely insane. And, in many ways it was. I felt horrible about myself, I hated who I was. And I assumed everyone else felt the same about me as I did. I was unlovable. Of that I was sure. Please know that I am in no way equating my addiction and eating disorder to autism. I am simply describing the feelings of isolation and sadness that can be common in both. It took a long time for me to get the help I needed in order to stop. But once I found people like myself, (and this is where the similarity in our stories lie) I was able to see, finally, that I was NOT alone. I remember thinking it couldn’t be true. But it was. There were hundreds and hundreds of people, in every city all over the world, some were suffering just as I was, others knew what it was to suffer, but had moved beyond those painful feelings. That was the first step out of my personal hell and into another way of living. A way of living where I could look at myself in the mirror and finally, finally like what I saw staring back at me. Over time, with a great deal of support, I was able to begin behaving in ways that were honest and true to myself. I was able to slowly stop trying to please all those other people that I felt condemned me, saw me as a failure, as a “bad” person. And now, (I’m in my 50’s) my life is better than I ever could have imagined. I have a wonderful husband who knows me and loves me exactly as I am, who loves me even when I’m angry, sad, irritated and feeling grumpy. I have two beautiful, amazing and unique children, one who is considered neurotypical and one who is autistic. And I am a very, very happy human being. But thirty years ago, I was not. You are beautiful, Genisa. Let us love you until you can love yourself. (Someone said that to me early on in my recovery from bulimia – I had no idea what they were talking about and I didn’t believe them, anyway. But they did no matter what I said or felt they loved me and eventually I was able to too.) Reach out as you have, again and again, find those you feel comfortable talking to, develop a relationship with them. You are not alone, Genisa. You are so not alone. And you ARE beautiful. Please reach out to me anytime. I, like so many others, am here. Oddly enough I was planning to write a post about commenting on blogs and comments in general. Just as I was sitting down to begin the post, I received an email telling me one of the blogs I follow had a new post. The post was entitled – For Ariane and Those Who Lie Awake At Night. “And with that said dear reader, if YOU need help, if YOU are overwhelmed, contact me. Talk to me. Let me or another parent who has been there listen and help you. If we pooled our resources and decades of experience just think of the difference we can make for each other and for our children. I don’t know if any of this makes sense to everyone reading this, but each comment I receive on Emma’s Hope Book is like a little gift. Each time I comment on someone else’s blog and they reply, it’s the same. A little gift wrapped up in words to savor. So to all of you who have commented – thank you. And to all who haven’t, but think about doing so, DO! It’s wonderful and I promise you, I’ll respond. I promise. Posted in @The Huffington Post, Autism, Autism "Awareness"
The following post has just been published on Huffington Post. This piece is important to me as it is the introduction to four or five subsequent posts I am planning for the entire month of April, written by autists. April, for those who may not be aware, is “autism awareness” month. These autists who will be writing posts for me to submit are the voices that have changed my life. These are the voices that, because they’ve changed my life are changing my daughter’s life. These are the voices that are NOT being included in all the fund raisers for “Autism Awareness.” How can we possibly hope for awareness if autists are not being included? Please help me by sharing the Huffington Post link (here it is again, in case you missed the first one) through email, facebook, tweets, share it, comment, please, please comment, even if it’s just to say, “I read this” and send the link to as many people as you can. We need these posts to go viral. And I need each and every one of you reading this to help me. Please. Let’s change what “awareness” means. With your help we can. For those interested, this is Paula Durbin-Westby’s blog, one of the autists who has agreed to write the first piece to kick things off for the Huffington Post. Most of us have heard, and many may have even read, some of Bruno Bettelheim’s ideas and work. For those of you unfamiliar – Bruno Bettelheim, born in Austria, came to some prominence when he became director of the Orthogenic School, in connection with the University of Chicago for children with a variety of emotional and neurological issues. His book, The Empty Fortress was published in 1967; read by many and touted as the final word on autism and its cause – the aloof and emotionally withholding mother. At the time, his views on the subject became widely known and the treatment for autism was to put the mother in psychoanalysis. The belief that the mother, in her lack of love for her child, caused the child to withdraw from the world was adopted by many. Bettelheim claimed a high success rate of children with autism in his school. It was only until after his suicide that many of his former students came forward with harrowing tales of abuse. Much of Bruno Bettelheim’s work and ideas have since fallen into question. The concept of the “refrigerator mom,” something he was an advocate of, has proven to have no validity. Last week I had a piece published in the Huffington Post – http://www.huffingtonpost.com/ariane-zurcher/children-with-autism_b_1080076.html – a woman, now in her nineties wrote to me about her experience of being the mother of a child with autism, diagnosed in 1961. Rather than examine her child when she sought help, she was put into analysis and blamed for her child’s neurological issues. She wrote a book, A Few Impertinent Questions, http://301­45.myautho­rsite.com/, that tells of her painful journey. It is a powerful story. As I read her book, I reflected on what we think we know now about autism and what will come to light in the future. Fifty years from now how will we view what we think we know? What ideas will seem almost comical because we will have learned so much more. What therapies will have fallen out of favor? What new therapies will have taken their place? What will be proven and seem obvious in fifty or sixty years from now, but are not obvious to us now? I, most likely, will not be around in another fifty years to know the answers to these questions, but I am sure much will be revealed.